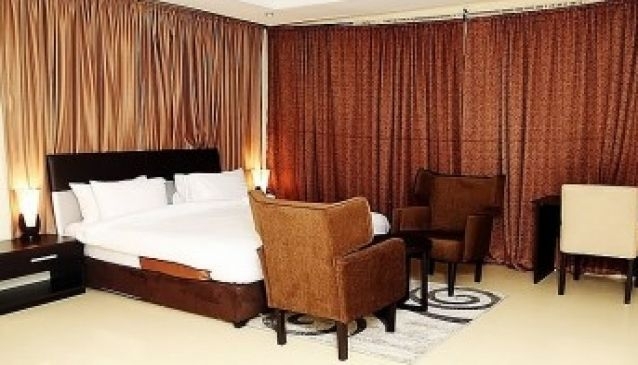 Sabitex Hotel is one of the high scale hotels in the Ikate/Lekki axis of Lagos. It can be accessed via the Lekki Expressway so getting here isn't difficult. The hotel has WiFi, quality room service, a spa and a gym. The rooms at the Sabitex hotel have comfortable beds, reading tables with chair, fridge, cable TV, Air conditioning system and safe. There is a bar & a restaurant where you can get food in both the local menu & foreign menus. The bar is a good place to sit & entertain a guest or meet other people coming in to Nigeria for leisure. Their halls can be rented for evens like inductions, lectures, religious programs as well as social events.